Well, it's been a while since I posted, hasn't it! I didn't intend to go so long without writing, really. The good news is that I have a few finished wardrobe garments to share with you. I'll spread them out over a few posts. This first one I'm showing you is one of my faves. I actually wore it to work today with some dark blue denim and brown boots. 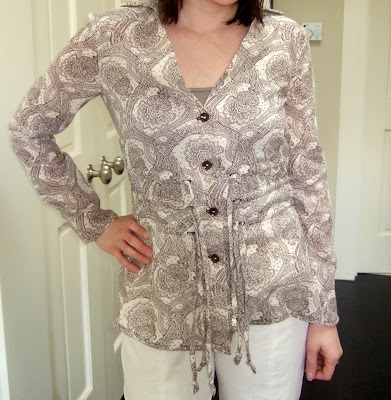 The first garment I completed is this lovely blouse from the May issue of Burda magazine. I fell in love with it based on the model photo. She just looks so easy breezy. Part of the reason for that is because her sleeves are rolled up, which I haven't tried yet, but I certainly will once the weather warms up. Brown on ivory print cotton gauze from Manhattan Fabrics. This was my first time ordering with them. I think I looked at this fabric online every day for a month before I finally bit the bullet and ordered it. The shipping costs made it a kind of expensive purchase but the cool thing is that they were very generous with their cut - I got more than half a yard extra! As far as alterations, I didn't make any. This fabric just loves to ravel, so I finished all the seams as French seams. I also used bias binding strips to cover the armhole's raw edges. Because of this project, I finally bought a Dritz loop turner. After the first very successful turn, I was all set to give this product a rave review. Then I had a few mishaps. You know, where the tube gets halfway turned out and then the loop turner looses it's grip on the end...leaving you with an inside out stub. Overall though, I'm happy with this notion, espcially considering it costs only about $3. I'm lovin' it! I toyed with tying all of the drawstrings in front, but I think it looks better when they are all loose, like in the line drawing and model photo. Your top is beautiful! Love the drawstrings! 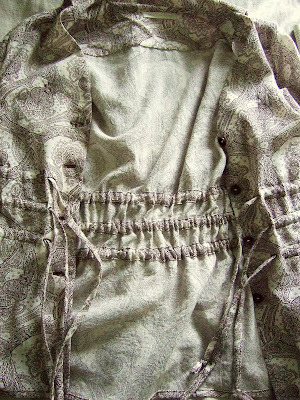 I love seeing the inside of garments, your sewing looks impeccable. Beautiful! Your top if absolutely gorgeous, not to mention your impeccable job at putting it all together! Very cute top and wonderful fabric. Love the fabric! Very nice top! Beautiful blouse! I love the drawstrings and the fabric! I thought you must have been very busy sewing away.... you have done a fabulous job on that blouse. Love the drawstring detail and fabric. Lovely. Lovely blouse, real nice fabric and nice details. Great job on this... putting it on my BWOF to do list (its a long list!) I love the drawstrings! Great print! Love the top on you. Beautiful!It looks great on you. Oh, I wish I got that magazine now-- that is a great blouse pattern!! Looks very good on you as well. Very cool top and it looks beautiful on you. I also love the fabric! The blouse is beautiful and fits you really good. I can't wait to see the rest of your creations. Beautiful blouse - I've always been fond of that one too. Lovely blouse! I really like your fabric, too. Very stylish top! Manhattan Fabrics is the online store of Paron Fabrics in NYC. They are the nicest bunch of people and are generous with their cuts in person. A must visit if you're in NYC. Great blouse! Burda always has something unique (compared to the big 4). Love the fabric! Thanks for showing it! I love that top and your interior finishes are fantastic! Beautiful job on the blouse! that is a really cool blouse. I like the yoke in the back. Bravo! The seams look so nice and clean! (Who needs a serger when you're a pro at French seams??) I love the buttons. That's a great top!! I'm excited to see your other garments too. Your blouse is gorgeous! This week has been a "I hate all of my clothes" week. Making a wardrobe is one of my long term goals. Yours will be inspiring. Very cute! I like that pattern too. 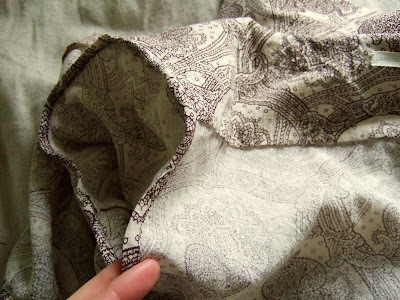 Your blouse turned out really well, I can understand why you lusted after the fabric. 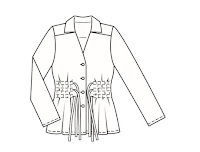 Since you have a cami on under the blouse anyway, have you leaving the it unbuttoned down to the middle drawstring and then just tying the middle one? Paula - I will give that a try! Hi Christina and Thanks for the lovely comment on my sweater. I'm in the process of doing another one, but thinking my cables are over overkill...lol. 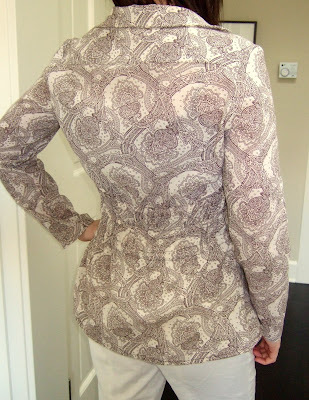 Can I say your blouse is Fabulous the fabric choice is gorgeous and like the details. I love the fabric you chose for this top and I can't wait to see the rest of the wardrobe pieces! Gteat blouse. You look marvelous. Beautiful blouse! I have this one on my list to make. But I do have a question for you--do any of the drawstrings hit you at the natural waistline? And if so, which one-top, middle, or bottom? Just wondering if I will need to lengthen the bodice since I am very tall. I have to say the construction details of this are wonderful. I love the way they have worked the drawstring and the back yoke detail. This is pretty fabulous. This is too gorgeous! I love it and your fabric is perfect for this style! I can't believe you didn't make any fit alterations! It looks so good on you, love the choice of fabric too. Don't you just love bound armholes? So pretty. It's very "designer"-looking, and I agree with everyone the fit and sewing are fabulous. I can imagine this also as almost a jacket, maybe in a slightly heavier fabric. I think the neckline and sleeves would lend themselves to that look quite well. I think it would also be really interesting in a solid color, maybe olive or grey or another neutral.